New GM CEO Dan Akerson met today with U.S. Treasury Secretary Timothy Geithner for a general discussion on the state of the auto industry and GM. WASHINGTON -- General Motors CEO Dan Akerson today held an introductory private meeting with U.S. Treasury Secretary Timothy Geithner, said spokesmen for the government and the automaker. GM is expected to launch an initial public offering of its stock as early as next month at an undisclosed price. The U.S. Treasury owns about 61 percent of the automaker after spending about $50 billion to rescue it. “This is the first time their schedules matched,” Martin said in an e-mail. Neither spokesman would discuss details about the meeting after it concluded. In addition to its plans to offer shares to the public, GM also is giving about 600,000 employees and retirees in the United States and Canada the chance to buy the shares. 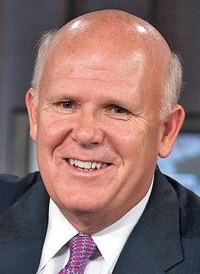 Akerson, a longtime telecommunications industry executive who later headed buyouts at The Carlyle Group equity firm, was named GM's CEO in August, when Ed Whitacre stepped down for a longer-term CEO to guide the company as it exits government ownership. Akerson had been a member of GM's board since it emerged from bankruptcy in July 2009. While Akerson has not commented directly on the IPO due to U.S. securities regulations, he said last month that the process of paying back taxpayers could take "several years."